Here at East Cheshire Hospice we offer a range of specialist treatments which can be used on an outpatient basis, as part of our day hospice services or offered to patients within the inpatient unit. Physiotherapy can help with a range of problems and symptoms, including: weakness, fatigue, breathlessness, poor mobility, pain, stiffness, soft tissue or muscle problems. Physiotherapists help patients to maintain or improve their function and independence, and will also offer strategies or carry out ‘hands on’ treatments to help control symptoms. Treatments such as heat, cold, TENS or acupuncture may be offered for pain or other symptoms. Find out more in the Physiotherapy leaflet. OT provides help and support when your health prevents you from doing the activities that matter most. 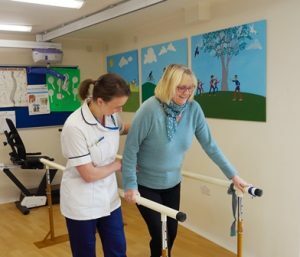 Our Occupational Therapist (OT) can help identify strengths and difficulties you may have in everyday life, such as dressing, bathing, comfort in bed, meal preparation or getting to the shops. Having discussed your priorities, the OT can help you work our practical solutions to these challenges. Find out more in the Occupational Therapy leaflet. Lymphoedema is a condition in which there is a build up of fluid that causes swelling in an area of the body. Some people with cancer develop lymphoedema due to cancer or cancer treatments. We offer a specialist lymphoedema service for inpatients, day care patients and outpatients. The aim of our service is to provide care, information & advice to relieve symptoms where possible and minimise the effects of your condition. Find out more in the Lymphoedema leaflet.